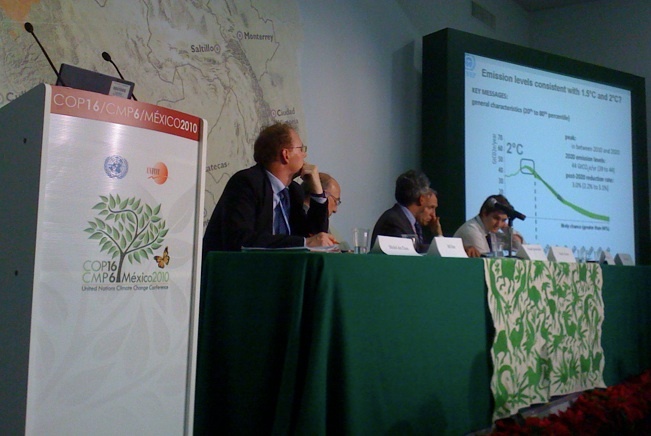 Yesterday, in a side event at COP-16 in Cancun, the Emissions Gap report was presented to a standing room only crowd, further evidence of wide interest in the question my co-authors and I designed the report to answer: Are current pledges in the Copenhagen Accord enough to move global society onto a 2°C path? In the halls of the negotiations we are hearing and seeing both NGOs and some negotiating parties referring to the study as they call for strengthening both the ambition of the pledges and the rigor of the system put in place to monitor emissions reductions. Today’s Eco, the newsletter produced by NGOs at the conference featured a summary of the study and called on the negotiators to ‘close the gap.’ You can download a copy of the newsletter here. It’s just one example of how the kind of rigor that simulation modeling brings to an issue can end up informing and supporting the conversation. There are no breakthroughs here in Cancun, and low expectations for any significant increase in the ambition of pledges anytime soon. But, the Emissions Gap report and other efforts have definitely helped make sure that those involved in the negotiation know where we stand and how much further we have to go. For more on the Emissions Gap you can watch a webinar I gave explaining the findings on the launch of the report.